From March 14 to 24, WPT Vietnam took command of Pro Poker Club in Ho Chi Minh City with 15 thrilling events packing the house from start to finish. The largest draw was none other than the Main Event breaking its previous attendance. 686 entered to create the biggest prize pool in Vietnam history of VND 15,105,034,000 (~US$650,900). Overall, WPT Vietnam pulled in 2642 entries and paid out over VND 42.1 Billion (~US$1,815,400) in prizes. This usurped APT Vietnam Kickoff 2019 as the largest festival hosted on Vietnam soil. Apart from the host country turning up in big numbers, India once again brought in a large contingent. Some of the countries also represented were China, Malaysia, Singapore, Hong Kong, Taiwan, Korea, and the Philippines. Earning highest honors was Vincent Chauve for his victory at the Main Event. He became an instant billionaire shipping VND 2,300,000,000 which was equivalent to roughly US$99,000. Chauve also took the lead in the WPT Asia Pacific Player of the Year race. After 11 days of nonstop action, the festival closed with Jaewook Shin taking down the High Roller event for VND 1,913,869,000 (~US$82,475). Wai Kiat Lee finished runner-up. At the start of the festival, Lee placed 2nd at the Super High Roller. Add his two winnings together, that makes him the highest festival earner for a total of VND 2,642,674,000 (~US$113,880). We’ve got that recap for you below. 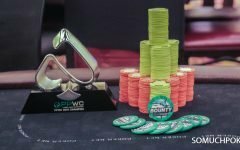 The three-day closing High Roller Event drew a very strong 212 entries – 173 uniques and 39 re-entries – over the course of two starting days. Day 1A ended with 13 players advancing. Day 1B saw another 41 make it through. 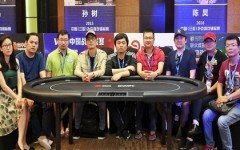 On the final day, 54 returned with exactly half the field due to pocket a piece of the VND 9,356,620,000 (~US$403,215) pot and half leaving empty-handed. As the day wore on, the bubble round arrived. Taking the hard fall was Francis Garson. He was all in against two players, Quang Nguyen with and Tzai Wei Phua whose cards were mucked at the showdown. Garson held . The board ran . From there, eliminations ran at a steady pace. Three hours later, the final table was formed at the fall of Erik Billgren in 10th place. Among the other ITM fallen were: Marvin Rettenmaier (14th), Calvin Tan (15th), Nikunj Jhunjhunwala (16th), Nguyen Van Dung (19th), Abhinav Iyer (20th), Iori Yogo (24th), Norbert Koh (25th), and Kalyan Chakravarthy (27th). The final table began with Jae Wook Shin leading which he held until it was down to five-handed where Edward Yam Chun Ho caught up and slightly overtook. However it was short-lived. Yam’s stack plunged to one bb after his ran painfully into Shin’s . Shin proceeded to take the rest on the ensuing hand and amass nearly half the chips in play. Benjamin Gonzva fell next with all his chips sent to Wai Kiat Lee’s side of the felt. This left the final three players who immediately reached a deal guaranteeing Shin VND 1,613,869,000, Lee VND 1,466,314,000, Phachara Wongwichit VND 1,430,058,000, and an additional VND 300M to the winner. The game resumed in rapid pace. Wongwichit was railed by Shin in 3rd place to amass 75 percent of the chips in play. The final hand saw all the chips go in on the turn . 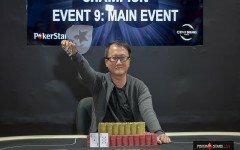 Lee had , Shin , the river sealed the victory for Shin as Danny McDonagh got on the mic announcing “Shin wins the High Roller with Doyle Brunson”. That concludes our coverage of WPT Vietnam. Next stop for the tour in the Asia Pacific region is New Zealand from May 31 to June 3. Players hunting down the WPT Asia Pacific POY title should head there. The top prize is a WPT passport worth US$10,000. Thank you for following us! Link to the full coverage available below!